This week Pedal Finder gives away an Aries Beast distortion from Celestial Effects and there is still time to enter, just check out this original blog post for all the details. Before we put a lid on the contest though, we thought we’d take a more in-depth look at the Beast itself. One of the joys of partnering with builders on giveaways is that we get to hook the pedal up and take it for a spin before we give it away to some lucky person. We did just that with the Beast and this is what we found. The Aries Beast distortion is housed in a durable metal enclosure that has just a bit of slope to keep the angle of your foot and the controls on the same plane. Four easy to reach/remove screws give you access to the innards where you will find the 9 volt battery connector along with posts to ensure the battery stays in one place. On the face of the pedal you have 6 easy to access knobs, the switch and an LED light to let you know all systems are go. The six knobs consist of the volume knob, three EQ settings (mids, bass and treble), a gain knob and a drive knob. The variety of knobs are what give the Aries flexibility without crushing the spirit of the uninitiated. In particular, it’s the two gain stages that really let you dial in different types of distortion. The first stage is controlled by the gain knob. It provides a really open tonal growl. This stage flows into the drive stage, which has a much more compressed tighter sound under the influence of a clipping-diode. Adjusting these two stages against each other is enough to drum up a wide array of sounds, but then Celestial gives you a three-band EQ to mess with and the possibilities seem to fly out to the horizon. According to a review at Premier Guitar one of the goals of the Aries was to highlight the mid-range tones prominently. We found that they absolutely succeed in this aspect. Using the three EQ knobs we took turns boosting treble and bass. All the while we were still able to primarily maintain a full, deep mid-range. All this even when we cranked up the gain and drive on the Beast past (what we consider) good taste. Overall, the EQ seemed very responsive and consistent across all knob settings. We got lost for awhile (in a good way!) playing with the two gain stages. The wide open gain stage leading into the tighter drive stage allowed us an array of distortions from full throated- growls and dense, chewable-chuggy-goodness to smoother, more responsive distortion that added more flavor to the tone than it did aggression. The places in-between these two settings are the fertile ground where you could loose a day while finding true happiness. No matter what your sign or when you were born, the Aries Beast Distortion has something to offer all musicians. The durable enclosure makes it road worthy, the selection of controls gives you flexibility without being panic inducing and the circuit design delivers on it’s namesake, for this pedal surely is a Beast. 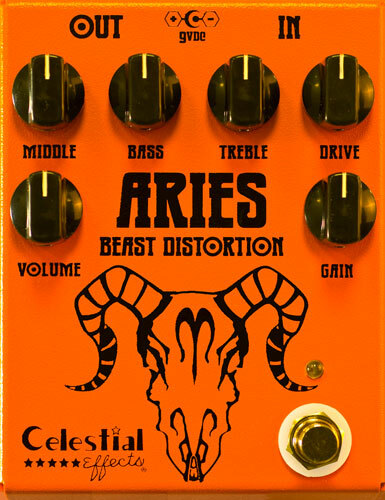 So take the time to check out the Aries Beast Distortion at the Celestial Effects website, because if you don’t win one, you’ll definitely want to find a way to buy one.